Guldensporen Stadion is a multi-purpose sports arena located in the West Flanders city of Kortrijk. Used chiefly for the football matches of Belgian Pro League side K.V. 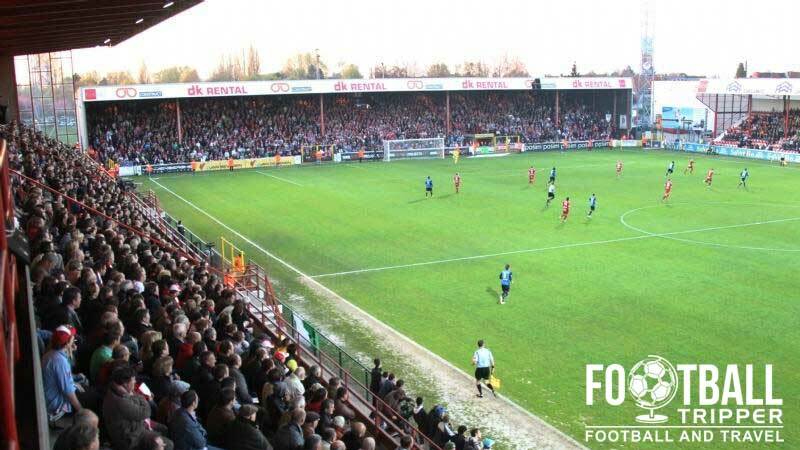 Kortrijk, the 9,399 capacity ground first opened in 1947 and was most recently renovated in 2008. Guldensporenstadion translates as “The Stadium of the Golden Spurs” which is a reference to the nationally famous Battle of the Golden Spurs which saw residents of Flanders successfully revolt against The Kingdom of France. Uprisings against Frenchmen started in Bruges and spread throughout the country with the city of Kortrijk, where the stadium is located, becoming an impasse where the two opposing forces met. Built just after the conclusion of World War 2 at a cost of around two million Belgian Francs which was at the time considered a very large fee, Guldensporen stadium opened on August 17th 1947 after around fifteen months of construction work. 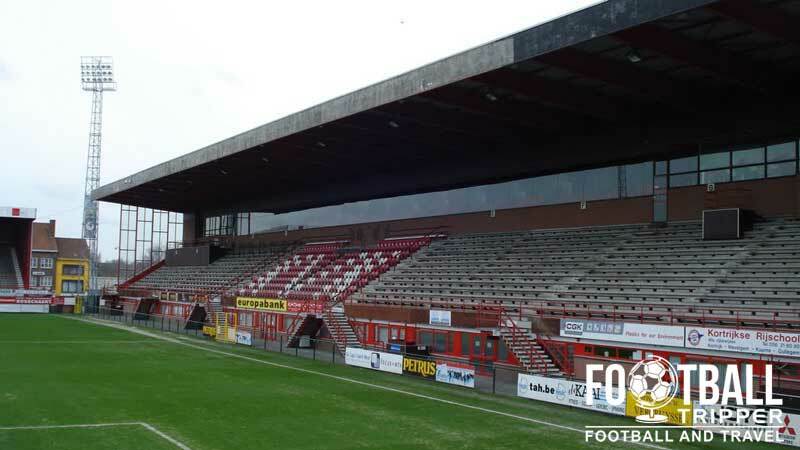 With K.V Kortrijk spending most of their history within the lower tiers of Belgian football, there has rarely been a need for the club to expand Goldensporen, with the highest capacity of 15,000 reached after the renovation in 1988. After the Heysel Disaster of 1985 , UEFA drafted new laws regarding spectator safety and in conjunction with the local council, KV Kortrijk completely rebuilt the main stand at a cost of around about € 1.8 million across a period of three years. As the tragedy occurred in Brussels, the impact greatly resonated with clubs across of Belgium. When large scale Concrete decay was found to exist within the older stands, the capacity of the ground was significantly reduced to around 6,896, until 2008 when the club were able to raise enough money to make the necessary repairs. Thankfully the club earned promotion to Belgian Pro League and were able to proceed with the restorations. The capacity now stands at just under 10,000 including 5,749 seats. Guldensporen Stadion is comprised of four stands: North, East, South and West. Away fans are housed within sections M, N and O within the tribune opposite the main stand. 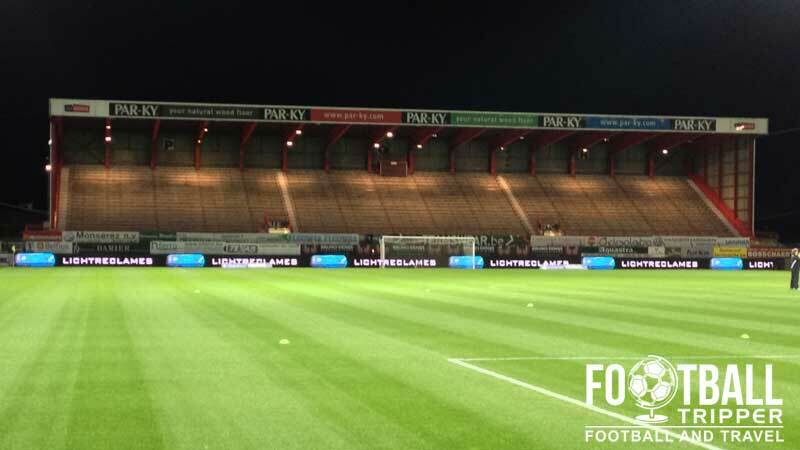 Tickets for the “Bezoekers” or visiting supporters section can be purchased from ticket office on the corner of Meensesteenweg road and cost a flat rate of €20.00 regardless of which team is playing away. 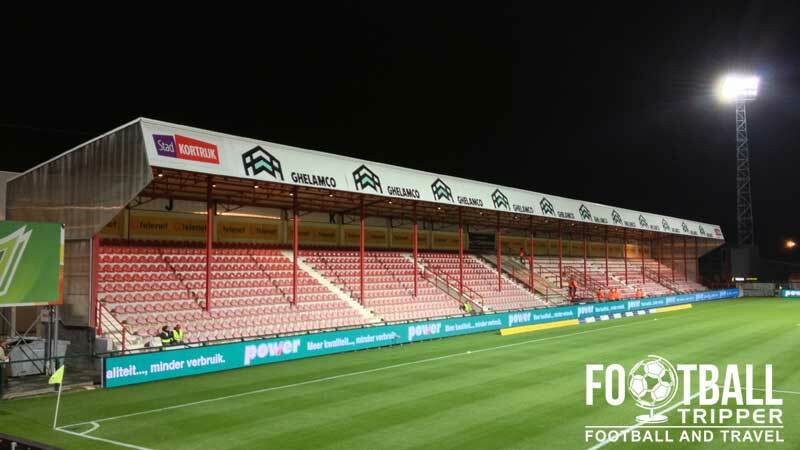 There is a KVK Fan shop at Guldensporenstadion which is arguably the best place to purchase official merchandise of the club, with the obvious exception of the online store. On matchdays the KVK Fan shop is open for at least 30 minutes before kick-off and for a further 30 minutes after the full time whistle. It doesn’t appear as if any tours are currently available of Kortrijk’s Guldensporenstadion. Tickets to see KV Kortrijk can be purchased online from the official website or from the ticket office at the stadium either in the days leading up to the match or providing there are any unsold, before kick-off. Please note that prices increase from anywhere between 3.00 – 10.00 for the highest profile fixtures against Anderlecht, Club Brugge, Standard Liege, Genk, KAA Gent and Zulte Waregem. Guldensporen stadium is located 1.8 km north of Kortrijk’s central area just across the river Leie along the R36. The walk from the centre of town is likely to take the average Football Tripper on average between 15 to 20 minutes. As there are no car parks at the stadium the club encourages fans who wish to drive to park in the area around the Railway Bridge towards Bissegem. Kortrijk railway station serves over 10,000 passengers a day making it the 15th busiest in Belgium and second overall in the West-Flanders region. The bus stop east of Euro Shopping Cente known as “Kortrijk Meensepoort” is served by bus numbers 4, 40, 42 and 61. There are a good number of hotels found within the inner ring road south of the River Leie and Guldensporen including recognisable names such as Hotel Ibis, Parkhotel and the unimaginatively named but well priced Center Hotel.